Sales of cars, trucks and SUVs all plummeted, capping the worst year for industrywide auto sales since 1992. 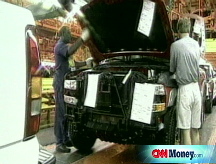 NEW YORK (CNNMoney.com) -- Battered by tight credit and the worst recession in decades, industrywide U.S. auto sales plunged 36% from year-ago levels in December, a decline that hit all of the major automakers, both foreign and domestic, and capped the industry's worst year since 1992. But despite the big drop off from year-ago sales, the December results were up about 20% from November, although the gain was more narrow on a seasonally adjusted basis. A strong final week of the month gave some experts a glimmer of hope that the weak sales that have plagued the industry have finally found a bottom. Weeks of worries that General Motors and Chrysler LLC could be forced out of business abated when emergency federal loans for the automakers were authorized on Dec. 19. "Whether it was the greater availability of credit or reduced fears of bankruptcy or pent-up demand or something else, we can't say," said Tom Libby, senior director of industry analysis for J.D. Power & Associates. "But things did take a slight upturn at the very end." Still, even if early December was a low point for sales, few experts predict a quick rebound for sales in the coming months, given the state of the overall U.S. economy, with the worst job losses in decades and continued weakness in home and stock values. "We believe the first quarter of 2009 will be similar to the last months of 2008," Libby said. "The customer has to feel things have stabilized and become confident once again." Of the major automakers, Chrysler took the biggest hit in December. Sales fell 53% from year-ago levels, worse than the 46% drop forecast by sales tracker Edmunds.com. By comparison, GM (GM, Fortune 500) reported a 31% sales plunge. That allowed it to post a modest gain in market share and was better than the 39% drop forecast. The other automakers posted U.S. sales declines for the month roughly in line with forecasts. No. 2 Toyota Motor (TM) reported a 37% decline, Ford Motor (F, Fortune 500) posted a 32% drop in sales, Honda Motor (HMC) a 35% fall and Nissan (NSANY) a 31% slide. The combination of high gas prices in the first half of the year and the worst recession in decades almost led to the collapse of two of Detroit's Big Three automakers: it took an 11th hour $13.4 billion federal loan package to keep GM and Chrysler from running out of the money they needed to continue to operate. Toyota warned late last month that it will report its first loss as a public company. Toyota, Honda and Nissan all reported an annual drop in U.S. sales, the first time there's been such a broad-based decline for those powerful Asian brands. Nonetheless, GM said its December sales were helped by a zero-interest financing offer that its GMAC finance unit was able to make during the last few days of the month after GMAC was granted status as a bank holding company by the Federal Reserve. GM Vice President Mark LaNeve said the news that GM would avoid bankruptcy also helped sales in the last half of the month. But experts said the slight improvement in sales the last week of the month wasn't unique to GM. Jesse Toprak, senior analyst for Edmunds.com, agreed that the greater availability of credit did help GM's late December sales. Some dealers reported that 40% of their sales for the month came in the last few days. But Toprak said part of the reason GM apparently beat forecasts was greater-than-expected sales to fleet customers, such as rental car companies. While those sales were off from a year ago, they were still stronger than expected by outside analysts, Toprak said. Toprak said his forecasts, which were based on sales patterns for December's first three weeks, had been predicting a seasonally adjusted annual sales rate of under 10 million vehicles for the month. Only the strong final week kept sales above that level, a floor that had not been breached in decades. For the year, GM's sales fell 23%. Sales of its car models performed somewhat better, slipping only 16% on strong sales of its Malibu sedan. But sales of its light trucks, such as SUVs and pickups that are the mainstay of its product lineup, tumbled 27% for the year. Sales at Ford (F, Fortune 500) fell 21% in 2008. Sales of cars at Ford, Lincoln and Mercury tumbled 11% while SUV sales plunged 42% and sales of trucks and vans slid 25%. Chrysler ended the year with sales down 30% from a year earlier. Sales of virtually every model it offered were lower than a year ago. The company said a big part of the decline for the year and in December was due to the drop in fleet sales to businesses, such as rental car companies. That was part of a deliberate decision by Chrysler to move away from this less profitable business. Toyota's full-year U.S. sales fell 15%, the second straight year that the Japanese automaker's sales declined in what is now its largest market. Sales of Toyota's car models fell 10% for the year, while its light truck models tumbled 22%. But unlike the U.S. automakers, Toyota (TM) and the other Asian automakers depend more on cars than light trucks for its sales. This helped cushion the blow for them somewhat. Record high gas prices earlier in the year hurt industrywide sales of pickups and SUVs. Combined, the industrywide sales of those longtime staples were down 40% from year-ago levels in December and were off 30% for the year. Light truck sales, which includes those offerings as well as vans and more fuel-efficient crossover models, trailed the sale of cars for the full year for the first time since 2000. However, light truck sales did perform a bit better in December, narrowly outpacing car sales during the month, helped by a combination of lower gasoline prices and large cash-back offers to buyers of larger vehicles. GM sales analyst Mike DiGiovanni said that the buyers of the larger, more expensive vehicles also were less constrained by the tight credit market than buyers of the the less-expensive car models. Ford tried to make the best of the bad month, saying that it expected to manage a narrow gain in market share for the third straight month. George Pipas, director of Ford's sales analysis, said this is the first time that has happened since 1997. But these gains came in the worst quarter for U.S. auto sales since 1981. And Ford executives cautioned that first quarter sales are likely to remain weak for the foreseeable future. Will the auto bailout work?